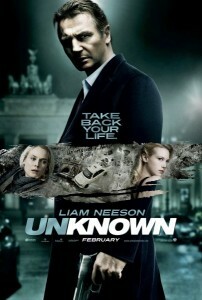 The film starts off with a gratuitous view of Liam Neeson’s nose as he is on a plane with his wife. This close up of his nose is rather humorous and lasts for a particularly long time. I can certainly see why. His nose has a rather peculiar and noteworthy shape. Moving on, the couple lands in Berlin, Germany. You soon learn that this little trip is both business and pleasure for the two. Liam plays Dr. Martin Harris, a badass botanist with a scientific conference to go to, with January Jones playing his wife, who is there for moral support, yada yada. Liam gets into a car accident with taxi driver Diane Kruger and then wakes up in the hospital four days later, confused that his wife has not come to find him. Liam goes to find his wife only to find that she doesn’t remember him and that another man is posing as Dr. Martin Harris. There is little else about the plot that can be said without major spoilers, because little events here and there tie back to the central mystery. Who is Martin Harris? It is at times painful to watch Liam stomp around an unfamiliar city where the people do not speak his language and his wife doing who knows what with a strange man. His attempts at convincing people that he is indeed Martin Harris are also cringe worthy. Desperation does not become him. This is a decent thriller. The central mystery is pretty interesting. As Liam attempts to discover his identity the audience is left wondering whether or not he is, in fact, the man he claims to be. But woah hoa! There is a strange man following him around! And guns! There are guns! So perhaps he’s not lying and that this is all a big government conspiracy! I’ve said too much already. There is a faint wiff of Taken with Unknown. For one thing, both films have one word titles, but beyond that, both have Liam in a role as “family man with badass fighting skills”. In Taken, he was a loving father. In Unknown, he was a loyal husband. So why is Dr. Martin Harris, a botanist in Berlin for a scientific conference, so good and punching stuff? Hmm… why indeed. Hopefully, this won’t turn into a typecast for Liam Neeson, who is by far too talented an actor to become resigned to such a fate. In case you were wondering about the strange exclamation in the beginning, it is a long story. Or rather not much of a story at all. I’m sure I will come up with a full explanation in the near future. Diane Kruger is always a joy to watch. Her performance was earnest and endearing as an illegal immigrant (Fun fact, she was actually born in Germany). In conclusion, Unknown is a pretty good movie. It keeps you on the edge of your seat and your mind engaged. While it may not be breaking any sort of new bounds, it was certainly fun to watch. And this guy? Frank Lagella is in just about every movie that I ever see. And he is awesome. He’s kind of like that guy that I just recently saw in another movie, which I will be reviewing shortly, The Adjustment Bureau.